It seems like oil spill history is playing an especially important role in the current debate over the Keystone XL pipeline and Northern Gateway pipeline projects. I recently wrote up a short piece on oil pipeline spills in Alberta’s history. 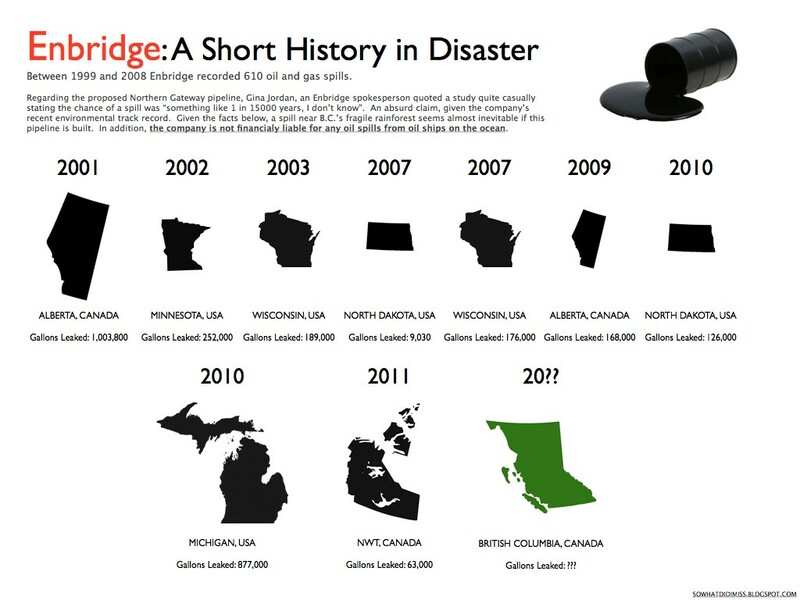 This history of recent oil pipeline spills associated with Enbridge underlines how important it is to remember the environmental history of this kind of industrial activity before making decisions about pipeline construction. dumb question perhaps, but, other than the major spill in north burnaby a couple years ago, is there any record of significant leaks or spills on the trans-mountain line through BC? its pretty interesting to see the archival records from Mount Robson Park about the initial construction of the pipeline back in the early 1950s. a letter comes in to parks branch headquarters saying something pretty much along the lines of “just so you know, a pipeline is going to be built through the park this summer.” no consultations, no studies or anything like that. its coming through, and thats that. so far as ive ever seen, the biggest problem with the pipeline in Mount Robson was that the pipeline company was accused of indiscriminate use of herbicides to keep its right-of-way clear of brush, which was considered an eyesore. id be very interested to learn more about spills and leaks over the past sixty years. When I did the short post on oil spills in the 1970s, I focused on Alberta and not BC. I’m sure you’re bound to find some spills with a little newspaper research for BC. The case of Mount Robson Park is also really fascinating . There is a lot to be learned here in terms of understanding the potential effects of the Northern Gateway project. Hi Sean ! Great page you’ve put together. – pipeline accidents or spills. – whether a defoliant was used to clear their right of way. Looking at your map of major spills I don’t see Ontario up there, so I’m hoping it has never leaked, though I doubt that. Good point, Jay from Ottawa. My own post on pipeline spills only focused on Western Canada. It did not include the pipeline network in Ontario. I don’t know much about the history of that network. Definitely worth investigation. Thanks for the reply Sean, I’ll let you know if I dig up anything interesting. Interesting synopsis. How deep did your study go? Was there only 2 spills in Alberta over the last 10 years? How much of the environment was and now remains contaminated? I have no idea how much land a million gallons could mess up. Thanks for the excellent questions. The information on the graphic in this post actually comes from http://sowhatdidimiss.blogspot.ca. This research only includes pipeline ruptures or releases on Enbridge’s pipelines, not the entire Alberta pipeline network. In that post, I surveyed newspaper coverage of pipeline spills mostly in the province of Alberta with a couple in other parts of Western Canada (and one spill in Washington) from the 1970s. I did not look further into the 1980s, but I would love to see someone complete that historical research (maybe I’ll get to it in a future post). In 2005 there were just under 1,200 hydrocarbon liquid releases on Alberta’s pipeline network. Your question about the environmental effects of these pipeline spills is very good. In short, I do not know. I guess we need to see if environmental impact studies have been conducted at any of these sites. If not, we need to see if any studies have been conducted in other parts of the world where similar spills have occurred. Again, there is more work to be done. Hi, I’m Rachel from the ecojustice classroom from Saskatoon. My classroom is an outdoor land and place based educationthat encourages critical thinking. One example I’d the “Caring for our watersheds program”. My class gets to create solutions/products to help care for our watershed, and have the chance to win money. The money would go towards the student lead year-end trip. For our year end trip, my class and I have been planning to go to Jasper. Before we do this, we need to do loads of research in order to plan the whole trip (the students have to plan the whole trip, expenses and everything). That’s what I commented for, I have to contribute to my classes proposal to the board of directors -to ask and see if they will grant us permission to grow-, a paragraph about water pollution in Alberta. I wanted to get to know all of the pipelines and where they are presently. Could you please tell me all of the pipelines in Alberta? And possibly a map of where they all are? Thank you. I honestly think you would reply. Thank you so much, I tried to find what I was looking for, and I couldn’t find it. Do you think you could just give me a list of all the pipelines you know of. I’m just trying to get an idea of the most main pipelines, and how they are polluting the water. But thank you for taking the time out of your day to help me.